If you want to experience independent mobility, the right combination of wheelchair and ramp is essential. All those places you have been trying to reach are available to you. Once you have experienced freedom and independence, you definitely don't want anything that meddles with your mobility. Sportaid brings you a one of a kind inventory of lightweight and portable TravelRamp Fiberglass Wheelchair Ramps to make your life little easier. Our main aim is to take care of your accessibility needs. Its smooth and no sharp edges are perfect for transporting scooters, wheelchairs, power wheelchairs and walkers. Our high quality selection of Fiberglass Wheelchair Ramps assures great support and comfort. 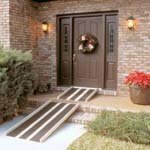 Like any other ramp, fiberglass ramps can easily be installed as a permanent or semi-permanent fixture in a home or workplace. To find the essentials for smooth and effective movement, browse through our huge selection and try out the TravelRamp Fiberglass Wheelchair Ramp in 3 ft, 4 ft, or 5 ft sizes below, or feel free to call 1-800-743-7203 for expert assistance. Save 12% on your TravelRamp Fiberglass Wheelchair Ramps at Sportaid! TravelRamp Fiberglass Wheelchair Ramps Are the Comfortable and Supportive Option! Fiberglass Wheelchair Ramps provide convenient access to places and locations where access has until now been restricted or unavailable. Sportaid offers safe and reliable choices in the form of TravelRamp Fiberglass Wheelchair Ramps. Ideal for indoor and outdoor use, these high quality ramps offer smooth operation and easy access. We offer Fiberglass Wheelchair Ramps in various lengths i.e. 3', 4', or 5’; you can opt for the suitable length as per your needs. You can take advantage of the satisfaction guarantee we offer our most loyal customers even if this is only your first or second visit. After over 25 years in the business helping people find TravelRamp Fiberglass Wheelchair Ramps at the lowest prices, we continue to lead the industry! We carry a large selection of wheelchair cushions, wheelchair parts, and wheelchair accessories. We are capable of beating any competitor's advertised price, just call! Our customer service staff has over 50 years of experience, plus over 90 years of combined wheelchair use experience. We look forward to working with you!